(CNN) -- Brazilian authorities on Thursday ruled the death of former world boxing champion Arturo Gatti a suicide, according to local media reports. Arturo Gatti was found dead on July 11 in a rented condo in Brazil, where his family was vacationing. Gatti's death initially had been investigated as a murder. The boxer's widow, Amanda Carina Barbosa Rodrigues, who had been arrested as a suspect, was released from jail Thursday, the newspaper O Diario de Pernambuco reported. Her lawyer, Celio Avelino, argued that it "would have been impossible for her to suspend and hang a man of that size". Gatti was found dead on July 11 in a rented condo in Brazil, where he was taking a vacation with Rodrigues and their young child. Police found strangulation marks on Gatti's neck and a blood-stained purse strap at the scene. The public safety ministry of the northeastern Pernambuco state said investigators determined that Gatti hanged himself in a stairwell, the newspaper O Globo reported. Police official Paulo Alberes said Gatti used the purse strap to end his life, O Diario de Pernambuco reported. The 37-year-old Canadian, who was born in Italy and made his name as a fighter based in New Jersey, was staying in the northeast seaside resort of Porto de Galihnas. Gatti made his reputation in his renowned trilogy of fights against "Irish" Micky Ward, losing the first but triumphing in the other two. He was a former International Boxing Federation (IBF) super-featherweight champion and World Boxing Council (WBC) light-welterweight champ. Gatti retired in 2007 after suffering a knockout defeat by Alfonso Gomez, ending with a record of 40 wins and nine losses, 31 by knockout. He grew up in Montreal, Canada, after leaving Italy at an early age, and returned to the city after his retirement. 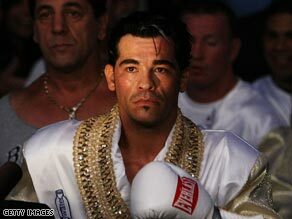 Gatti's suicide came less than two weeks after another world champion boxer took his own life. On July 1, three-time world boxing champion Alexis Arguello, who was the mayor of the Nicaraguan capital of Managua, was found dead in his home from a gunshot wound to the chest. He was 57. A third boxer, former welterweight champion Vernon Forrest, died last week after being shot multiple times in a neighborhood southwest of downtown Atlanta, Georgia.